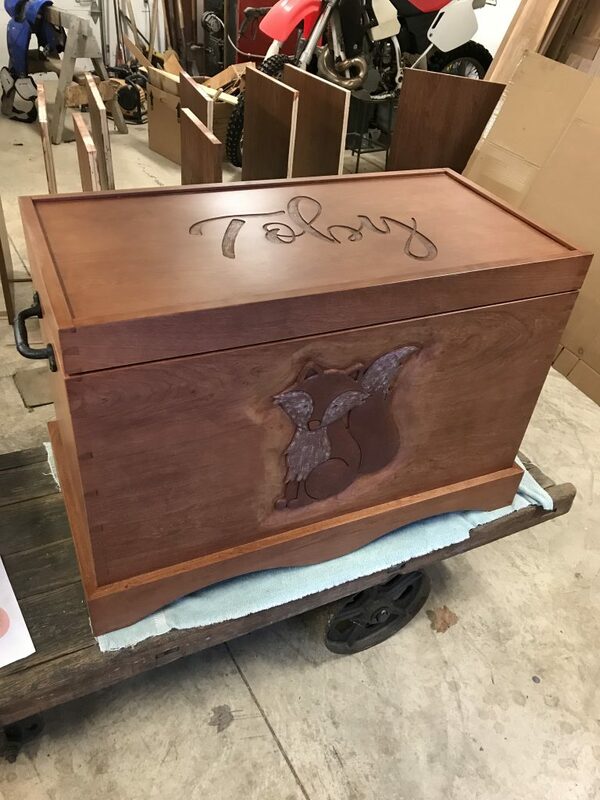 A few months ago we decided to have a chest made for Toby to hold all of his special things that have been in the nursery for 2 years. We wanted it to be special and a place where we could collect things for him, from him, about him and about the Foundation, while also being a display piece, in his memory, in our home. Our hopes came full circle when we were connected to a very special and talented man, Bruno, whose kids Dan taught when they were in elementary school at Shady Side Academy. 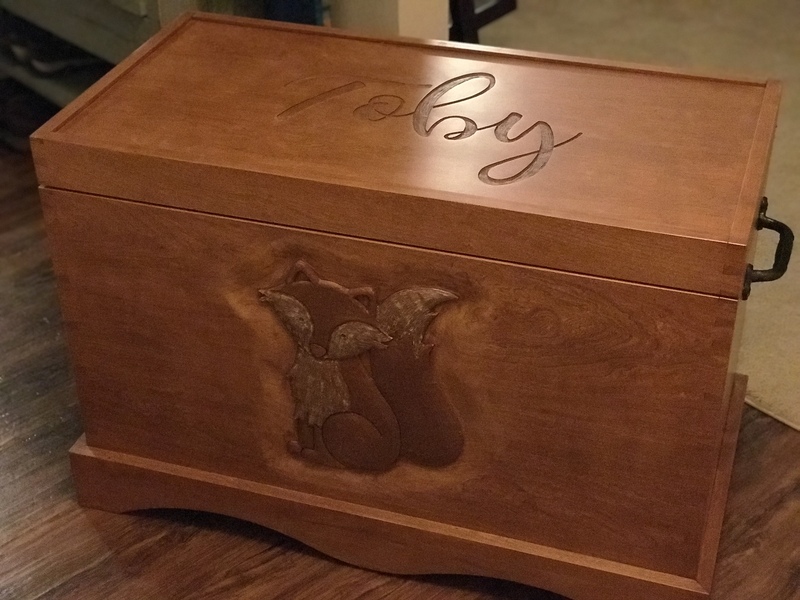 We talked with Bruno about Toby, our vision for his chest, and about the fox. 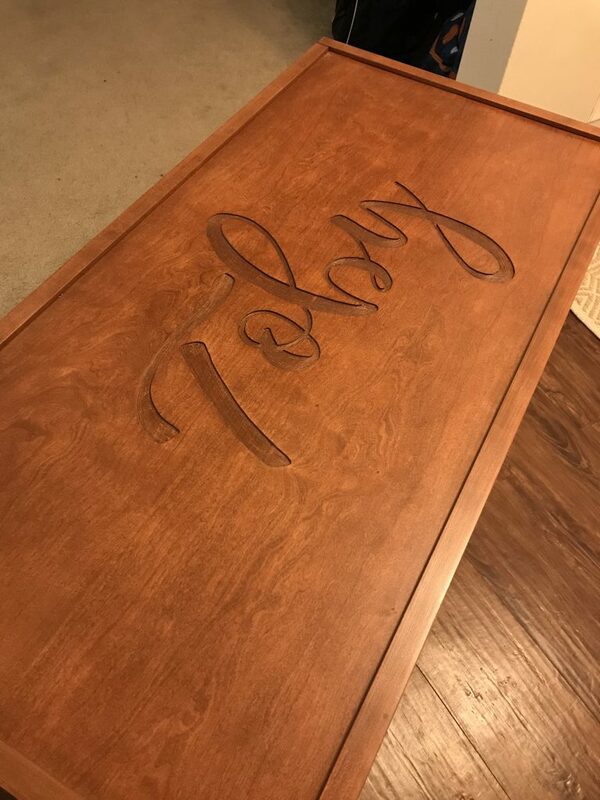 He spent time asking us questions and getting all the details he needed to create this piece. He guided us on elements, how it could last forever, and be as beautiful as possible. Tonight we went to pick up Toby’s chest that Bruno has been working on for two months. Today is the 24th of the month. Coincidence? We stood in front of this piece tonight in Bruno’s workshop, draped in a cloth. When Bruno pulled the cloth off the chest, I cried and Dan looked at it in awe. It couldn’t have been more beautiful or perfect for our little boy. “I know Toby was with you the entire time you were creating this,” said Dan. I stood in front of it and ran my fingers over the carving of his name. It was as if I was writing it and it made me think of all the times I’d never get to write his name throughout life. But it was so beautiful, I couldn’t help but smile through my tears. 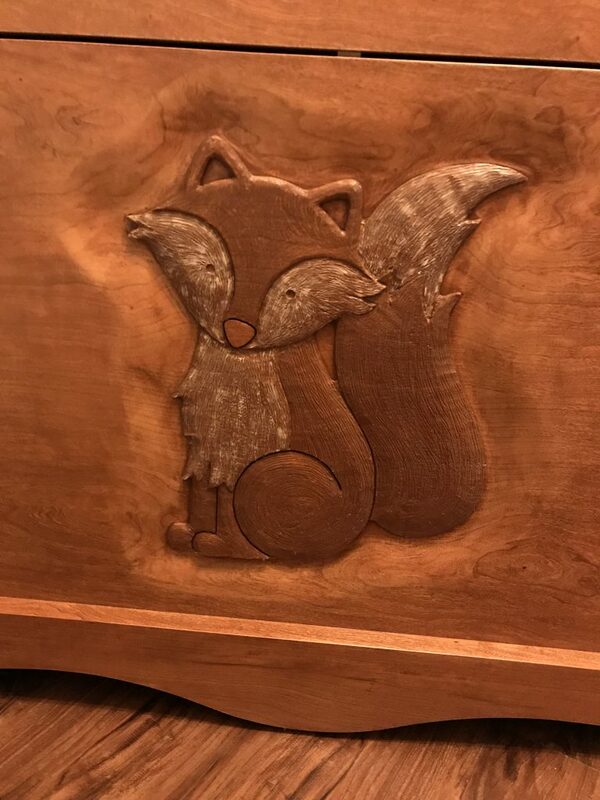 The fox that Bruno hand carved is so beautiful. I don’t think we could have imagined having something so perfect in this piece. It’s exactly what we wanted, and more after seeing the final piece. These pictures don’t do the actual piece justice. To stand in front of it is to be in awe of the beauty of craftsmanship, the talent of a man, his passion for creating special pieces for people that can last generations and the beauty of what can be created from nature. This is the inside lid, which we wanted a space to pin photos, cards, articles, etc. so we could see them every time we opened the chest. We spent so much time, during the 12 weeks and 5 days that Toby was here with us, outside. He was relaxed and happy to be with us and be outside. 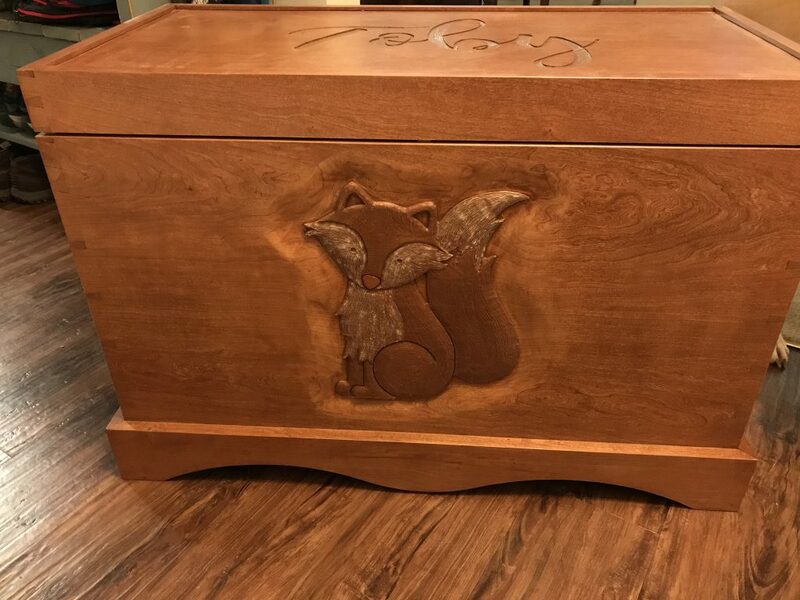 Having this piece in our home now, to hold his things and special pieces of his life, knowing the trees it was carved from and how special it was to Bruno to create it – all this tells me, this is exactly how it was supposed to come to be. 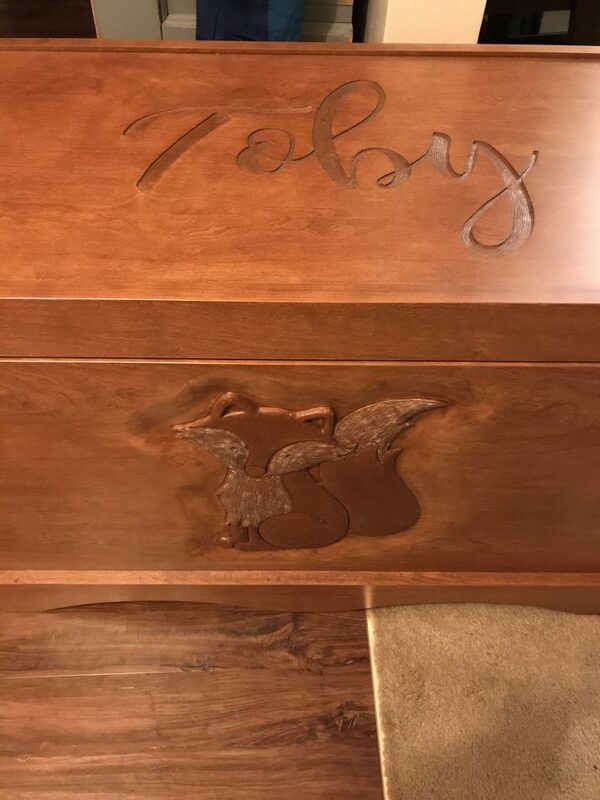 Thank you to Bruno and Happy Hollow Studio for creating this piece for Toby. 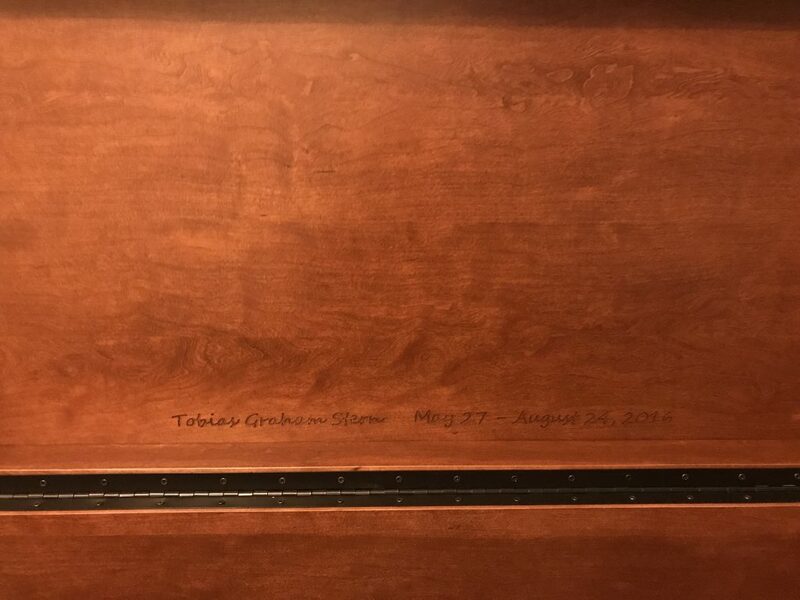 There aren’t enough words to explain how special this is to us and how grateful we are to have reconnected with someone with such talent and determination to bring our vision to life, in memory of Toby.